As long-time readers here will know, the Parlando Project likes to vary what it does. Loud, immediate and approximate rock’n’roll, string quartets, folkie and electronica tinges combine with words that I look around for—different stories each time, most of them not mine. Are we now going to vary from Bronze Age Chinese poetry collected to instruct politicians? Or from the W.H. Auden-who-can-bring-the-funk remarks of Jimi Hendrix’s ET visiting the Third Stone from the Sun and marveling at the chickens? A famous orange retainer and a famous blue raincoat. And that was the hook for today’s parody. I thought of another Cohen living in New York City, who is a principal in another messy romantic entanglement, whose feelings about it are multivalent, and whose sincerity is a changing thing. You can hear “Sincerely, M. Cohen” using the player below. * If you want to hear Leonard Cohen’s “Famous Blue Raincoat” first, you can see a lyrics video here. ** Am I depending on the Parlando reader/listeners outside the US this time, and yet assuming you have any interest in juicy U.S. scandals? *** Ever wanted a coherent reading of the Cohen song? Here’s one of the best I’ve read. This is great! Leonard Cohen is my favorite musician and Famous Blue Raincoat is my favorite song of his. It’s interesting that even he thought the lyrics were confusing. I certainly do. Like, what’s the deal with Jane? On the one hand she seems to live with L. Cohen, since she’s been sleeping, but on the other hand she stopped by. I was seriously tempted to violate the My Year in 1918 rules and read the Best American Poetry piece, but I just glanced over it and then put it aside for 2019 reading. (Blogs like yours are exempt from the post-1918 reading ban because I need to be part of a community.) Even though I’m not reading 2018 news, enough has gotten to me through the ether for me to appreciate the parody. It’s just a bit too strong to say that Leonard Cohen saved my life as a teenager, but he gave me hope of integrating parts of my life that are perhaps impossible to integrate. My initial reading of his “Famous Blue Raincoat” was that it was a love triangle (Jane, someone unnamed, and Leonard) and the delicate balance was that someone unnamed had slept with Jane and had a connection deeper in some ways to her than Leonard, but that Jane has stayed with Leonard which says something too, the “she sends her regards” line being a subtle dig. The whole thing feels a bit like one of the over-arching plot lines of his big novel “Beautiful Losers” which reinforced that feeling at the time. 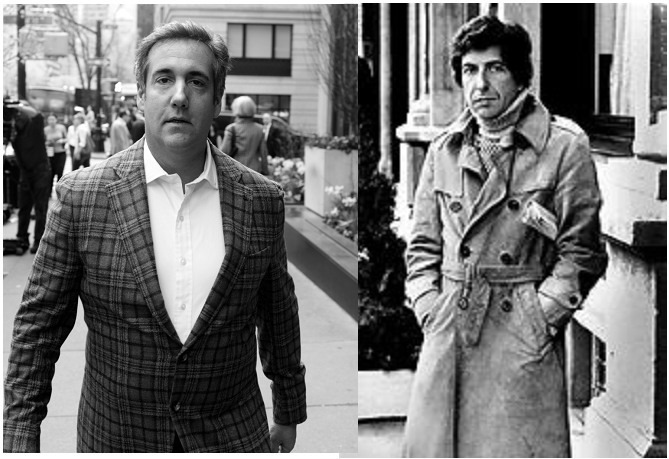 But the weird thing that occurs to those deep into the tiny biographical facts of Cohen fandom is that the someone unnamed shares Leonard Cohen details: the long-running raincoat, the dalliance with Scientology, the tendency to go off a solitary walkabouts, to not remain the steadfast, long-running partner. This could make sense if you thought that Cohen had decided to write about the love triangle not from his point (or Jane’s) but from the point of the someone unnamed. The article I linked solves this is a way that I couldn’t quite articulate myself: both the someone unnamed and L. Cohen are both Leonard Cohen. I suppose it’s possible that despite his craft, Leonard Cohen didn’t fully articulate that to himself or interviewers either. But none of that is necessary for the song to work, at least not for you or for me. Just the sense of confusion, the ebb and flow and cross-purposes of love made it attractive to me. And most of the cover versions are by women, who possibly relate more to the ambiguities of feelings than men with with an on/off toggle switch about love.That and it has a lovely melody (Cohen is under-rated as a melody writer) and the acoustic guitar part of the original (might have been played by Cohen himself) is so good too. Cohen also liked the Paul Buckmaster string arrangement, which I hear as effectively simple and something I can hope to approach within my limits. Well, so much to my making a travesty of such a wonderful song for low satiric motives (grin). Your comment leads me to think that your 1918 project ends in only a few months. One one hand I can understand the value of setting limits (I sometimes wish I had done so with my project for the get-go)–but I’ll miss it quite a bit. do you know what you will do next, or are you just looking forward to not knowing what you will do next? I have a similar history with Leonard Cohen–I first came across his music when I was taking guitar lessons in elementary school in the early ’70s. My 17-year-old teacher was a Judy Collins fan, so we used her songbook, which included a lot of Cohen’s songs, including Suzanne, Sisters of Mercy, and Bird on the Wire. I was intrigued by the mysterious adult life they described. I have no musical talent and never got very far with the guitar, but I’m grateful to my teacher for opening up that world to me. My Famous Blue Raincoat trajectory is similar to yours as well, with my initial confusion compounded by taking “my brother” literally. Then I read “I’m Your Man” and learned about his raincoat and dabbling in Scientology, and I also wondered why the letter writer was L. Cohen. You’re right that it doesn’t matter in the end and that it’s the song’s very lack of straightforwardness that makes it so compelling. I’ll have to check out the covers–I’m only familiar with the Jennifer Warnes one. As for my own project–when I was preparing for it, a blogger friend told me that I shouldn’t give it a year-specific name because what if I wanted to go on to 1919? (She had to change her location-specific blog name every time her husband got transferred to a new Foreign Service post, until a few weeks ago when she renamed it The Next Dinner Party.) I said no way, it’s a one-year project only. But now that the end is in sight, I can’t imagine giving up the community that I’ve come to be part of, or leaving the early 20th-century world behind. On the other hand, I can’t continue indefinitely reading ONLY from 100 years ago. What I’m leaning toward is reengaging with the current century as far as reading goes but keeping the blog alive and maybe expanding its focus. (But stuck with the 1918 URL because I didn’t listen to my friend.) We’ll see! Oh, and I forgot that I have a CD called “Leonard Cohen in Afrikaans” that has a version.